After the success of Nintendo's mini retro consoles, we have seen others attempt to follow in its footsteps. The Commodore C64 Mini and SNK Neo Geo Mini arcade immediately spring to mind as quality competitors. Now it is good to see Sony enter the fray with a blockbuster effort dubbed the PlayStation Classic. It has been almost 25 years since the original PlayStation was launched, says Sony. Remarkably, the original PlayStation was the first home console to ship 100 million units worldwide, so the new PlayStation Classic could easily be a hit with nostalgic gamers. 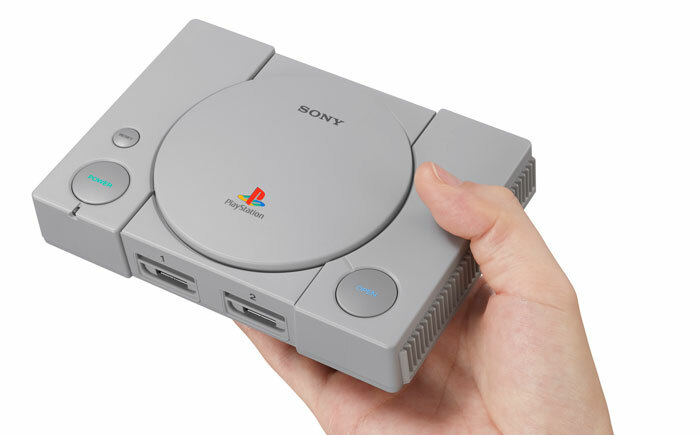 Owners and admirers of the original console will immediately recognise the PlayStation Classic, though it is 45 per cent smaller than the original (as compared in the image above). On the topic of hardware, the new console features an HDMI TV/Monitor connection port, and what looks like a USB Type-C connector, perhaps for power only. There are additional rear flaps which could open to reveal further ports but we don't know at this time. On top of the console are the original buttons which work, mostly, as you would expect. The power and reset buttons work as described but the open/eject button doesn't pop up a mini-CD/DVD lid, it just allows you to swap 'virtual discs'. On the front the memory card slots don't operate but the console includes built-in memory for save game storage. Sony provides two full size replicas of the PS1 original controller so they aren't DualShock designs, and thus you don't get the analogue sticks or vibration. If you look closely you will see these connect via USB, recessed within the larger Sony pad style ports at the front. The new Sony PlayStation Classic mini console includes 20 pre-loaded classic titles to enjoy. This sounds quite generous considering how much more storage these will use up compared to rival NES/SNES/C64 games and similar. Sony says that "all of the pre-loaded games will be playable in their original format", so they don't sound like they will be cut down editions. Sony will reveal more of the built-in games in the coming weeks/months. It will be interesting to find out if there is some way of adding more games to this console. Sony's PlayStation Classic will become available from 3rd December 2018. Regional pricing is $99.99 USD / $129.99 CAN / €99.99 EUR / £89.99 GBP. me thinks adding games would be through the USB port, discovery of what image format the games are would be an advantage to do this. I wonder what these mysterious rear flaps are for. Maybe, for a full nostalgia hit, Sony will allow you to spend a further 20 quid on a 1MB memory card. Good idea but you can buy full sized original ones for less on the likes of amazon and ebay, albeit used. And as stated above, you can always emulate the games instead provided you own the various licenses! Still, nice novelty toy for a Christmas gift!